“is the Kundalini energy the same power as Buddha’s enlightenment?” (more from Cambodia) | Realise the World! The arrival into Cambodia was very smooth. The bus ride very joyous with old rock tunes and Shri Ganesha song at our arrival into Phnom Penh. MOJ were welcomed at Phnom Penh airport by the Malaysian Sahaja yogis who had come earlier to put up some posters and place advertisements in the local newspapers. The whole Sahaj team was composed of 15 MOJ (Vinod came back to Australia after the China trip) and 11 Malaysian yogis. We stayed at the Princess Hotel, comfortable with nice wooden interiors and offering professional foot massage which a few of us enjoyed! The 16 July coincided with Tony’s birthday which was celebrated in an Italian pizzeria with the participation of their 10 staff who proposed to put a big candle on a pizza and sing Happy Birthday to our brother… they also brought some balloons. It was very joyous. They really shared our joy and it was very natural for us to propose them the experience of Self Realisation which they did all collectively. This was the actual first collective Realisation in the country. Jai Shri Mataji! Cambodia with a population of approximately 13 Million still recovers from a difficult past including wars and dictatorship and shows that its economical development is not achieved. Phnom Penh shows many buildings not maintained some roads in poor condition, some people begging in the streets… although one could see a few Luxury cars, shops selling gym equipment, modern musical instruments, etc. The local currency is the Riel but the US$ is preferred. The airport is not modern as the ones in Vietnam or China…however the checking in and out was the quickest of all the other airports! The main religion in Cambodia is Buddhism. The quality of this country resides in its people who are very pleasant, gentle and polite and also very open. The Cambodians are happy to meet foreigners, are simple but cultured, and the younger generation can speak English well. We found the atmosphere very relaxed and enjoyable with a country town feel. Phnom Penh has good food outlets as well as street side snack sellers selling fried snakes, crickets, cockroaches, cicadas, frogs etc….not to the taste of everyone! 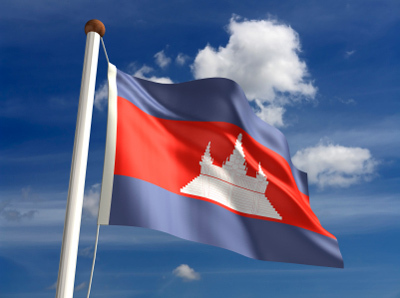 Cambodia has suffered a lot in the past and seems now ready to grow and move on. The evening program was held on 17 July at the Sunway hotel, located in the area of the foreign Embassies…at a short tuk-tuk (local rickshaw) distance from the hotel. Due to the monsoon season one could feel the dampness in the air which was cleared with incense and air sprays. A havan with candles was held in the hall prior to the program. About 35 Cambodian seekers came along. Sita from the Malaysian collective introduced Sahaja Yoga and was translated by the hotel manager’s brother (who is also a seeker). MOJ performed a mix of western songs, bhajans, Chinese song, kawallis, etc. The evening was tremendous with vibrations and joy. Everyone got up and danced on the divine tunes which concluded with Mahamaya Mahakali that describes the infinite beauty of our Divine Mother and Creator. The next day at 10am 17 people attended the follow up program (15 from the first program including only 1 young lady + 2 hotel staff). We had the opportunity of a one-on-one workshop. We found that the various catches were clearing quite fast. One man’s agnya chakra opened saying this mantra “is the Kundalini energy the same power as Buddha’s enlightenment?” Two other men were very clear about what they were looking for, i.e. the subtle system and how to do meditation. All people felt cool and didn’t seem to be conditioned in anything. We didn’t feel any aggression. They were very genuine. Their attention was settled. Generally people’s response was good and ready to receive the pure knowledge. At the end of the session all were very enthusiastic and were asking when they would see MOJ again. We told them that we would come again next year… too far away! they said. The Malaysian Sahaja yogis will hold another follow up program around the 24th of July.